Cosmic Fortune video slot is another NetEnt game which offers a local progressive jackpot, a bit like Divine Fortune that we’ve recently reviewed. Local progressive jackpot slots are super fun because they fall more frequently then network ones. And when it comes to Cosmic Fortune, nothing could be truer. Because this game, generally speaking, attracts a lot of players since the way you’ll win a jackpot is absolutely unique! All and all this video slot offer 5 jackpots, and 3 of them are progressive. In fact, as you spin the reels, you’ll notice that the Mega, Major and Midi Jackpots will progressively increase. The mini and the rapid, on the other hand, will always give you the chance to win £500 and £100 respectively. Bonuses & features: Free Spins, Avalanche, and Progressive Jackpots. Highest-paying symbol: 5 Game Hero Symbols awards 1500 coins. The video slot Cosmic Fortune is an avalanche game. Which means you’ll create a chain reaction of explosion after every win as the symbols move downwards on the game interface to make room for new ones. The main symbol you’ll need to keep an eye out for. It is the Golden ball with a flash of blue lightning. This symbol will automatically give you 10 Free Spins when 3 or more land in view. During the Free Spins bonus, you’ll collect balls with every win. And if you manage to get 10 or more, you’ll move on to the next stage of the game where your goal is to get 3 balls in the bonus basket. If you succeed, you’ll move onto the last stage where you’ll need to get 3 balls in a jackpot basket to win it! The second symbol you need to watch out for is the blue ball with a big W on. This symbol is, of course, the Wild and will help you make winning combinations. 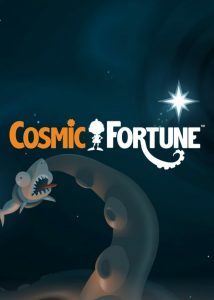 Cosmic Fortune is one of the first local progressive jackpot game released by NetEnt. Although it’s a 2014 casino game release this slot aged very well. But this game is Flash-based, which means that if you want to play it on a Mobile, you’ll need to download the Adobe plugin. And if you’re looking to win big on this slot on a desktop, you’ll need to make sure your browser plugins are up to date and flash enabled too. Generally speaking, you’ll only need one click to do that. But if you’re having problems don’t hesitate to contact the customer care department via Live Chat! Our team tested all casinos advertised on casinoservice.org/uk. So we’re certain the agent you’ll speak with will be able to put you on the right track so you can try to win a life-changing amount!